We've known for a long time that fluoride strengthens tooth enamel against decay. We've also learned that fluoride consumption early in life pays later dividends with healthier teeth. But while fluoride has generally proven safe, too much ingested by young children could cause enamel fluorosis. This condition produces a mottled or streaked appearance in teeth ranging from faint white patches to darker, pitted staining. Fluorosis doesn't harm teeth, but it does make them less attractive. To prevent this, it may be necessary with your dentist's help to monitor your infant's or young child's fluoride intake and keep it in check. That will depend in large part on where you live, as well as your child's hygiene and eating habits. Like three-quarters of public water systems, your local utility may be adding fluoride to your drinking water. The amount is governed by federal guidelines, which currently recommend fluoride amounts of no more than 0.70 parts per million of water. 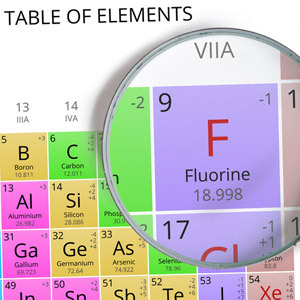 The fluoride levels in your water could have an impact on your child's total fluoride intake. You can find out for sure how much fluoride is present in your water by contacting your water utility company. Another major fluoride source is toothpaste and other hygiene products. You can control your child's fluoride exposure by limiting the amount of toothpaste on their brush. Children under two only need a “smear,” while those between two and six need only a pea-sized amount. Processed foods can contain fluoride if fluoridated water was used in their production. In this case, replace as much of the processed food items in your family's diet as you can with fresh fruits, vegetables and other foods. This can be a lot to keep up with but your dentist can advise you. Fluoride is still a potent weapon against tooth decay and a safeguard on your child's current and future dental health.